The Wici Song and Dance Theater was organized in 1972 in Chicago. Its mission has been to promote Polish culture in both the Polish and American communities through song, dance, and music. Wici has carried the traditions of their ancestors through with their authentic costumes and original choreography. In 1983, Wici was established as an Illinois charitable nonprofit corporation. All of the members of the company perform without any compensation or monetary reward. Thanks to the efforts of their members and their sincere love of the Polish and American culture, the group has maintained an artistic standard that many professional troupes would envy. Over 8,000 young people and adults have participated in the group’s activities since its origin. Wici is comprised of two groups totaling over 300 dancers, musicians, and artists. The children’s group, Male WICI, was founded by Magdalena Solarz in order to educate young dancers and to prepare them for the adult group. Male WICI currently encompasses ten children’s groups, ranging from ages 3 to 14. Two hundred and fifty children dance in Male WICI, and the representative group is composed of over 70 teens and adults. The company performs to the accompaniment of a live folk band. In addition, the group boasts an exceptionally large store of hand-made costumes imported from Poland. Complete collections of colorful men’s and women’s attire made from the finest materials (wool, velvet, and silk), include embroidered undergarments, footwear, accessories and headpieces, and number in the thousands of items, some of which are priceless original handicrafts. Wici participates in over 60 performances each year, 60% of which are viewed by American audiences. Wici has performed in cooperation with the Grand Theater and Opera of Warsaw and Lodz. The company has performed at many renowned theaters all over the world including the Chicago Symphony Orchestra. They have also produced choreography in the world renowned Benet production of the Nut Cracker, Sleeping Beauty, Swan Lake, and Coppelia. Wici has also worked in partnership with the Glen Ellyn Opera House. For the past 12 years, the company has also partnered with PASO – the Paderewski Symphony Orchestra in a variety of concerts ranging from operettas to musical cabarets. WICI also participated in the Polish Theater of Chicago’s production of Polish Bethlehem, but these are only a few examples of the group’s notable achievements. WICI has also appeared at the prestigious John Paul II Cultural Center in Washington D.C. It would not be an exaggeration to say that Wici is a phenomenon in the Polish and American artistic circle. Wici has traveled and performed at venues all over the world including Canada, Italy, Poland, the Caribbean, and Mexico. In the upcoming year we are looking forward to travel to many new destinations and sharing our love of music and dance. Several years ago, we started exploring American folklore and music including country western and clogging. 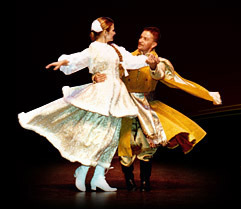 One of our new dances comes from the Cold Mountain Region and is filled with musical excitement, jumps, lifts and of course beautiful authentic costumes. The Wici Song & Dance Company hopes to continue enriching the American culture with vibrant ethnic variety.